The Migratory Bird Treaty Act (MBTA), signed into law in 1918, is among the oldest and most effective wildlife protection laws on the books. When Congress passed the MBTA in 1918, it codified a treaty already signed with Canada, then part of Great Britain. The Treaty was in response to the serious overharvest of numerous bird species that had resulted in extinction in a few instances and near extinction in some species. Since 1918, the MBTA has broadened its international scope through treaties with Mexico, Japan, and Russia. The MBTA is credited with saving numerous species from extinction, including Trumpeter Swans. 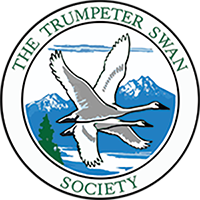 It continues to protect nearly all native birds in the U.S. covering more than 1,000 species, including Trumpeter Swans. Legislation in Congress (HR 4239), and a new interpretation of the law by the Administration, would end the ability to hold industries accountable for bird deaths. Industries would only be held accountable if their intention or purpose was to harm birds through their activities. This rolls back decades of bipartisan support and interpretation of the MBTA. It also removes industry incentives to prevent bird deaths and its associated penalties. We know powerline collisions are a significant source of swan deaths. Powerline collisions cause deaths to other bird species as well. According to studies, powerlines kill up to 64 million birds a year. Communications towers are estimated to kill up to 7 million birds per year, and uncovered oil waste pits account for up to another 500,000 to 1 million bird deaths every year. Data on wind turbines are harder to come by, but current estimates are approximately 234,000 bird deaths a year. Wind turbines have not been associated with significant swan deaths, but transmission lines serving turbines are linked to swan deaths. We at TTSS have advocated against a number of significant proposals for high power transmission lines across important migratory corridors and habitats and asked the lines be moved. The new interpretation negates such advocacy. Urge your members of Congress and the Department of the Interior to uphold the Migratory Bird Treaty Act and to oppose its new legal interpretation. The new interpretation was issued in late December 2017 without the need for public comment.